Eddinger Hardware & LP Gas, Inc.
Eddinger Propane Gas, Inc. has been family owned and operated since 1890 and is now operated by the fourth generation of EDDINGERS. 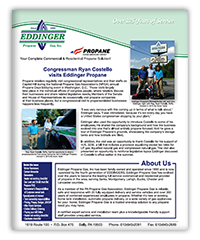 Eddinger Propane Gas has evolved over the years to become the leading full service commercial and residential provider of propane in the area, serving Berks, Montgomery, Lehigh, Bucks, Chester & Lancaster counties. Have a question or want us to contact you? Copyright © 2016-2019 Eddinger Hardware & LP Gas, Inc.